The TS-653B comes with a sleek new look, featuring an OLED panel and two capacitive touch buttons. The TS-653B also features a PCIe port for boosting the potential applications of your NAS: the QNAP QM2 expansion card can be installed for adding an M.2 SSD cache/10GbE connectivity, a compatible wireless card can be installed to use the TS-653B as a wireless access point, and a USB 3.1 10Gbps card can be added for easier backup to/from multiple external storage devices. With a USB Type-C QuickAccess port and a SD card slot, the TS-653B simplifies transferring and sharing files without needing a network connection. The TS-653B also provides feature-rich multimedia functionality, such as 4K video playback and real-time transcoding. The multi-zone multimedia management app Cinema28 and popular web automation app IFTTT Agent also enrich your multimedia experience and NAS automation. Powered by the latest 14 nm Intel® Celeron® J3455 quad-core 1.5GHz processor (burst up to 2.3 GHz), up to 8GB DDR3L RAM, dual Gigabit LAN ports, and SATA 6Gb/s, the TS-653B runs tasks smoothly and quickly with up to 225 MB/s read/ write speeds. The TS-653B features Intel® AES-NI hardware-accelerated encryption to drive transfer speeds of up to 225 MB/s with AES 256-bit encryption for both full NAS volumes and shared folders, boosting system performance and security while ensuring the safety of sensitive data stored in the TS-653B. With PCIe expansion, the TS-653B provides flexibility in extending NAS functionality and potential applications. Install a QNAP QM2 card to provide M.2 SSD caching/10GbE connectivity, or use the TS-653B as a wireless access point by installing a compatible wireless network card, or boost the USB connectivity of the TS-653B by installing a USB 3.1 10Gbps card. QNAP's QM2 is a PCIe expansion card that features dual M.2 SSD slots and 10GbE connectivity (individual cards may vary in functionality). This allows users to easily set up SSD caching or to enable Qtier auto-tiering technology to optimize NAS performance. 10GbE-compatible models can also future proof the TS-653B for use with 10GbE networks. Equipped with a dedicated cooling module, the QM2 can maintain its high performance even when tasked with the highest workloads. The TS-653B features an all-new design with a sliding cover. The tool-less 3.5” hard drive installation makes it easier for users to set up and maintain the TS-653B. The OLED front panel displays system information (including temperatures, fan speed, and the capacity of hard drives, volumes and LUN) allowing you to quickly view the overall system status. Dust-proof capacitive touch buttons allow you to easily wake up the screen, change network IP settings and host password or even restart and shut down the system. The TS-653B features an innovative USB-C QuickAccess port that allows you to complete the first-time installation and setup of your TS-653B without requiring network connectivity. The files and data stored on the TS-653B can also be directly accessed by using Qfinder Pro* and a USB Type-C cable**. You can also assign access rights to users for different folders to prevent unauthorized access to important files. The TS-653B supports SMB, NFS and AFP, allowing you to quickly share files to Windows®, Mac®, and Linux®/UNIX® devices. With QNAP's Qsync utility, the TS-653B becomes a safe data center for file synchronization with huge storage potential. Any file uploaded to TS-653B can be synchronized to all the linked devices such as computers, laptops and mobile devices. You can also sync shared folders to increase the flexibility of collaboration and file sharing. The SDEX card slot makes it easier to directly access and back up files stored on them, and the new exFAT driver (optional purchase, sold separately) provides compatibility with newer, faster SD cards. The TS-653B’s QTS-Linux dual systems are based on QNAP’s advanced virtualization technologies. The revolutionary architecture of the TS-653B enables users not only to download rich apps from QTS App Center but also to develop or utilize IoT packages for Linux® and display them using HDMI output. With the TS-653B, you can develop and install various IoT packages on demand and centrally store the data on the TS-653B, benefiting from a secure private storage and development solution. The TS-653B is an iSCSI/ IP-SAN storage that supports VMware® and Citrix®, and is compatible with Microsoft® Hyper-V® and Windows Server 2012® R2, fulfilling the need for flexible deployment and management in virtualization environments. The TS-653B supports VMware VAAI and Microsoft ODX to increase performance by offloading server loading for ESXi server and Hyper-V respectively, and supports QNAP vSphere Client plug-in and QNAP SMI-S provider with enhanced operational efficiency and management in virtualization applications. Virtualization Station allows you to host virtual machines (VM) on the TS-653B and access them via a web browser or VNC. Virtualization Station supports multiple operating systems, fast VM creation, VM backup & restoration, VM import/export, snapshot, and Device Management for centrally managing VMs. Virtualization Station allows the TS-653B, VMs and containers to share the same LAN port. No longer constrained by physical network performance, high-speed virtual switches greatly increases data transfer between VMs, containers and NAS through the internal interface. The TS-653B also features Container Station, which integrates LXC and Docker® lightweight virtualization technologies. You can operate multiple isolated Linux® systems on the TS-653B as well as download apps from the built-in Docker Hub Registry®. Containers Station also supports the QIoT Containers platform that helps quickly structure your IoT environment and deployment on your private IoT cloud. The new QVPN combines VPN server and VPN client functionality. Through QVPN, the TS-653B can be used as a VPN server with L2TP/ IPsec, OpenVPN, and PPTP support, allowing you to securely access data shared within the private local network. The TS-653B can also be used as a VPN Client to connect to other VPN servers or virtual private network through PPTP and OpenVPN for secure data transmission. VPN Client also allows your NAS to connect to multiple servers at the same time. You can connect your devices to your NAS and the VPN server at home to access data on the LAN and via VPN Client on your NAS, you can connect to international VPN servers for accessing regionally-restricted services such as Netflix and Hulu in HD Station. The TS-653B provides you with various VPN options and helps secure your data transmission. Featuring advanced 9th-generation Intel® HD Graphics, the TS-653B supports 4K (H.264) hardware decoding and delivers superior real-time 4K (H.264) and 1080p video transcoding to convert videos to universal formats that can be smoothly played on multiple devices*. QNAP Linux Station is integrated with Ubuntu® OS, allowing users to download and install versatile multimedia apps from Ubuntu Software Center, such as Plex Media Server, KMPlayer, LibreOffice and VLC. QNAP's HD Station also allows users to directly enjoy multimedia using HD Player or third-party players such as Plex Home Theater. By connecting the TS-653B to a HDTV or A/V receiver with HDMI output, you can enjoy watching videos with up to 4K resolution. Beyond multimedia applications, the TS-653B has dual HDMI output that supports using the NAS as a workstation with “duplicated” or “extended” desktop configurations. The bundled QNAP remote control allows you to control the TS-653B and enjoy best audiovisual experience. Refer to ISO 7779 ; Maximum HDD loaded ; Bystander Position ; Average data from 1 meter in front of operating NAS Designs and specifications are subject to change without notice. design 6-Bay NAS devices are always slightly ignored in the broader technological community. Pricing for them generally means that you feel you could buy a 4-Bay and put the saved money towards bigger HDD. Or you think if I just spend a tiny bit more, I can buy an 8-Bay NAS. However in the case of teh TS-653B NAS, QNAP have managed to hit the design and the cost for this 6-Bay perfectly. Alot of this is down to that compact and mostly plastic chassis. Managing to be quiter than more likewise sized NAS, the TS-653B also gives you the functionality and connectivity of a 8-Bay, whilst still saving you space, energy consumption and money. Easy in my TOP 3 6-Bay NAS of all time. features As already mentioned in the TS-253B and TS-453B, this NAS is the produt of years of design and innovation from QNAP. It manages to be both small, yet feature (or let you upgrade to) almost every conceivable connection type. With features like Dual HDMI, DUAL LAN, PCIe Slot, SD Card reader, Quick Connect DAS, one touch USB 3.0 Copy, Hot Swapping, new and improved remote control and more. 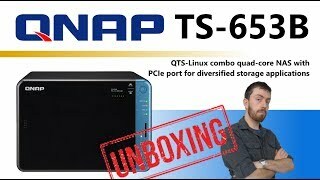 This is fast becoming the home and SMB NAS that those looking for the perfect balance of storage capacity vs physical size and ability will choose this 2017.
performance The QNAP TS-653B arrives with the new and fast Intel Celeron J series CPU and 4/8GB of RAM means that it will handle most of the popular NAS tasks required of it. Functions, services and applications like Plex, Kodi over HDMI in Linux Station, VMs, standalone surveillance, all RAID levels, DLNA support, apple time machine, Mac and Windows full RTRRR, QVR Pro Beta are all possible with the TS-453B and can be set up quickly and easily. You will be looking at an excellent degree of future proofing in this NAS server. value When I first heard about this NAS back in Feb 2017 at a Photography tradeshow, I was interested. When it was on show at ITPartners 2017 expo, I was impressed. When it was on display at CeBit 2017 I was excited and now I am fully set consider this and the TS-253B and TS-453B to be real game changers for many this year. It really comes down to this and the TS-c53A Series for your NAS needs. Step up Synology, time to fight back on this! design For those who prefer a litte more metal in their hardware, you may well wish to opt for the QNAP TS-653A. What it lacks in connectivity, it gains in almost 95% metal design. features There is still no denying that for many users, 6-Bays is just not the right number and will fast make the switch to TS-453B NAS. performance Lacking popular options like Thunderbolt 3 and 10GBe (though that can be added with a PCIe card in the PCIe x8 slot on the back) and this may be a dealbreaker for some. value Once again, many will be put off by the plastic and lack of Thunderbolt 3 connectivity and will consider skiping this in favour of the TVS-1282 series. Read more about Qnap TS-653B-4G auto tiering. If you buy this Qnap Desktop NAS and hard drives we do free build and test for the unit and hard drives. So you can use this device straight out of the box. All free of charge in TS-653B-4G price.